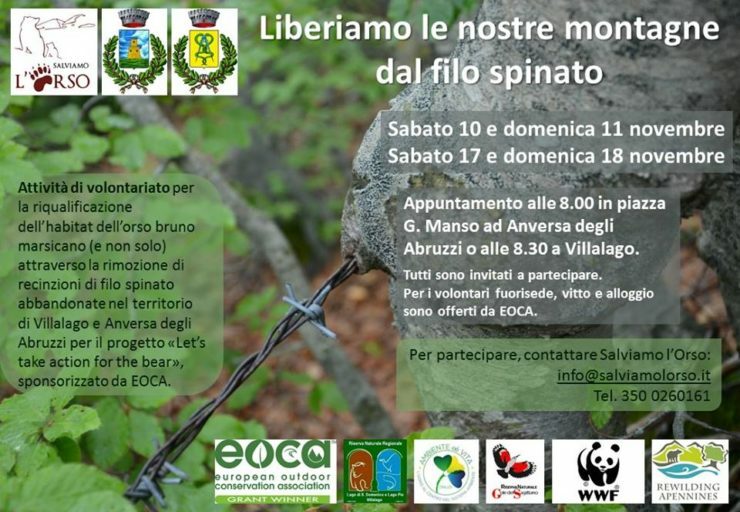 In the next two weekends, 10-11 and 17-18 November, the association Salviamo l’Orso, in collaboration with the Municipalities of Villalago and Anversa degli Abruzzi, the Regional Nature Reserve of Lake San Domenico and Lake Pio, the Nature Reserve and WWF Oasis Gole del Sagittario, the WWF Abruzzo, Ambiente e / è Life and Rewilding Apennines, will carry out a voluntary activity aiming at the removal of abandoned barbed wire fences in the territory of Villalago and Anversa degli Abruzzi to restore the habitat of the Marsican bear and other wildlife species. This action is part of the “Let’s take action for the bear” project by Salviamo l’Orso, sponsored by EOCA – European Outdoor Conservation Association. All citizens who care about the environmental and landscape integrity of our mountains are welcome. Food and accommodation are sponsored by EOCA for non-residential volunteers. Please contact Salviamo l’Orso at info@salviamolorso.it to join this important event.